A few days ago, the below post was in the feed of our Executive Director’s Facebook page. It had been shared by a couple of people. It reminded our Exec. Dir. of a post she had written last year as Hurricane Harvey was bearing down on Houston, reminding us that there are some who for reasons we ignore are unable to flee to safety in an emergency or in the blink of an eye. Far too often, we chastise those who stay when the hurricane is coming, yet ignore them as the storm of poverty is always knocking on the door. Thank you Gwen, for writing this post as a reminder that poverty is the flood that is always coming. The below is reprinted with the author’s permission. Two nights ago I called Alyeesha -- a friend of a friend who had stayed at my house a few years ago when she was escaping a bad relationship. She lives Down East, back in her hometown in Carteret County, in a small one-room house that was her grandma’s sharecropping cabin. She rents the cabin from the man who now owns the land; it is not hers. I’ve been there once. She had a mattress on the floor, a sofa from a Rent-a-Center, and a picture of her grandmother on the wall. I wanted to let her know that if she was evacuating from the hurricane, there was a sofa waiting for her here. Everyone I know Down East and on the shore is riding it out. For a few it’s bravado, but for most of them, it’s… it’s just that they can’t go. There aren’t enough seats in the car, or there is no car, or the car is busted. There are too many babies or too many old folks. 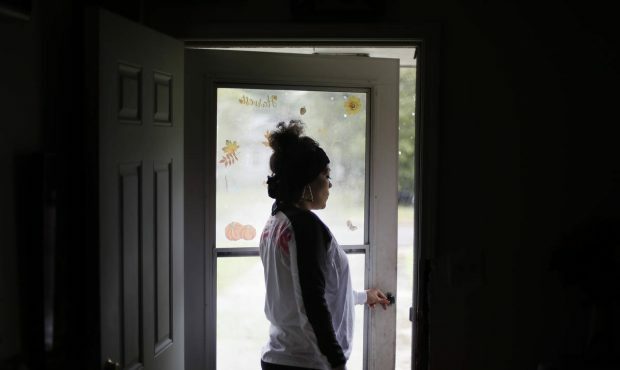 There are jobs that won’t be held for them if they can’t make it back in a few days; there are paychecks that haven’t yet cleared; there are food stamps that ran out last week. And there isn’t enough money in anyone’s damn bank account. But you know, we all love a good hurricane. We fetishize storms. We are glued to our televisions and we are refreshing our screens. We talk about the wind speed, we marvel at the tattered piers. It’s almost like we want it. Truth is, I think Alyeesha and all my friends are going to be just fine during this hurricane. After all, as terrifying as it is, we know it’s not Florence that is wreaking havoc on North Carolina. It’s everything that comes later; it’s everything after the storm; it’s everything that was before. We know that it is the slow seep of the water back down from the mountains, spreading itself out of its riverbed path, breaking itself out the creeks and cricks, rushing itself off the pavement of the cities and going Down East. It’s water swallowing up crops and homes and pigs -- we know this slow seep and we know that it is not just water; we know it is poverty. The hurricane is the drama, the excitement that we need. We gather bottled water, toilet paper, snacks. It’s something we can do, something we can prepare for. We like the idea of bracing ourselves against wind; we feel enraptured, intoxicated, instinctual, alive. Our lives can be so mundane. So we watch, we watch, we watch. We gorge on hurricanes. But the flood that we know is coming is something to look away from; something we try not to speak of. It is smeared red clay up living room walls. It’s stalled out Buicks getting their last rust. It’s somebody’s work tools sinking into the river. It’s humid air plastering an old Myrtle Beach t-shirt onto a body as it shovels filthy toys into trash bags. It is mud and muck and poverty. And we know it is coming. It is all very predictable. And we will look away. Poverty has always been a flood and not a hurricane. It’s always been a slow rolling disaster, with muddy gray water under an incongruent bright blue sky. It’s always been a slow build of mold between generations, of people making do with babies in faded red milk crates being floated on mattresses down city streets. Look away. Poverty is slow. It’s a looming light bill and a long wait on child support. It’s the uncomfortable plastic chairs at DSS and the caseworkers who don’t make eye contact. It’s the ten months of pregnancy with no insurance and lying to the doctor about the cramps because you can’t afford a referral. It’s the long wait in jail because you can’t afford bail and long Christmas days when you can’t afford presents. It’s the long nights with the heat out and the long calls trying to reach the landlord. It’s the hours in detention after your own boss at the meat processing plant calls immigration on you and the long stare you give him while he hires your cousin for less money under the table. Sometimes poverty is even the long last minutes trying to get through the locked door at the Hamlet Chicken Plant. So we look away. Poverty is predictable. It’s the predictability of underfunded schools and outdated textbooks. It’s the predictability of an entire two generations of fathers and mothers being locked up and their left-behind children staring cold-eyed and speaking tight-lipped during the Pledge at school. It’s the predictability of legislators turning their heads and hog waste and coal ash breaching levees. It’s the predictability that after the storm we will arrest the looters who spent their last dollars on gas when prices surged up 50 cents before the storm. The predictability of all this makes us look like fools, like forty-something men wanting twenty-something wives. And we are embarrassed by it all. We will look away and not say a thing. We don’t have to look because we know where the flood waters will go. They will follow a slow, predictable path. We know who lives in low lying areas, we know what neighborhoods are south of the tracks. From Appalachia down, every town has Hillers and Creekers and floodplains read like economic and racial maps. Alyeesha has the grit to make it through the storm, but after the winds pass and the bottled water gets loaded back up, she knows that people’s attention will just move on. Jim Cantore does not come for poverty. Alyeesha’s little house may be flooded out, she may lose everything. There is no insurance company to call; her landlord may just tell her he can’t do nothing, just move along. Her friend who drives her to work may not be able to come to get her, she may lose her job. She will be left standing in the still waters of America, brown water on her brown legs, on land that was not her grandmothers and is not hers, with no place but my sofa to go. But that’s the predictable slow drip of poverty. All your life you are just watching the water rise, knowing no one is coming to get you: after all they told you to get out.